Blitz R-VIT UNIVERSAL - Dezod Motorsports Inc - Home of the automotive performance enthusiast since 2002. The BLITZ R-VIT (Racing Vehicle Information Technology) is a state of the art monitoring system that can read and display up to 20 different types of Real Timer information provided by the factory ECU. The BLITZ R-VIT is a fully digital monitoring device with 5 different types of digital displaying capabilities (Needle Meter, Ellipse Meter, Bar Graph, Triple Monitor, and Six-fold Monitor). 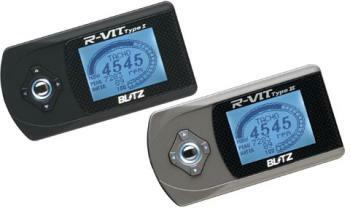 The BLITZ R-VIT feature peak-hold recording, playback features, that can record and replay up to 99 seconds. Limits can be set in flash and audible warnings to notify the driver of different engine variables, thus reducing the chances of damaging the motor. R-Vit and SBC i-D INFRARED connection: The R-VIT can communicate with the SBC i-D boost controller via INFRARED to operate the speed and tachometer, OPT 1/OPT 2 readings. The BLITZ R-VIT can be used on most Japanese Imports 1996 and newer with the on-board diagnosis port. For Nissans 1989-1999, use BLITZ R-VIT Type II. For Toyota manufactured before 1996, BLITZ will be releasing an R-VIT Type III in the future.